Fellow cat-loving mail enthusiast Catwrangler has the most amazing collection of rubber stamps, and she's not afraid to use them! She is also generous with her mail, sending me lots and lots when I still haven't responded to her, and sending other random goodies. 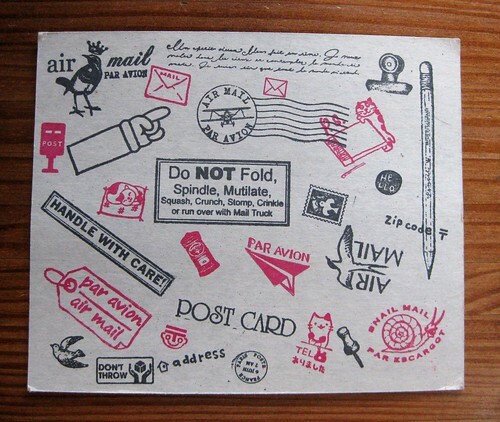 I think I love every single one of the stamps she used on this all-stamp handmade postcard. And so many of them are meta! I heart meta mail. Yay letter stamps. And look, that's her own kitty on the Zazzle postage stamp, too. OMG I was shocked to see this post. I am glad that you enjoyed it. These are just a sampling of my mail themed stamps. I have bought a bunch of large stamps that I am now trying to paint in. Not very easy. It is always an honor to send you mail. 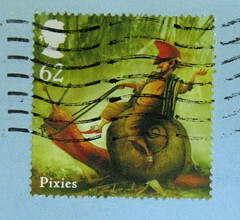 Love the stamps I really love the Do not one I so need a stamp like that. she does have a fab collection. Catwrangler rocks! Love the typewriter stamps and the pile of letters. Love the collection and wish I had many of them! What an enviable collection. Great job catwrangler. I haven't found half as many mail themed stamps. Wish I could. Forgive me, for posting this here, but I thought I had read the other day on your blog (though in truth, it could have been another) about the proposed closure of the USPS? I found a brilliant article about this, and wanted to give you the link in case you had not previously come across it -- I personally didn't realise the dire situation at hand! I mean, waiting out the Canada Post strike was difficult enough, but now, its our turn to sort out how to save MAIL? OY! Anonymous person: You did not read that info on my blog. I have refrained from comment on the postal service's current woes, for a variety of reasons that I won't go into here. Thank you for the link, though. I do not have a tag cloud on my blog anymore. I used to, but removed it quite a while back. India - If there is a subscribe via email option, I'm unaware of it. That's not how I run my blog. Feel free to visit and check out new posts whenever the spirit moves you, or "follow" via Google reader to be updated of new posts. Where is everyone seeing her stamps? Are they available for sale somewhere? 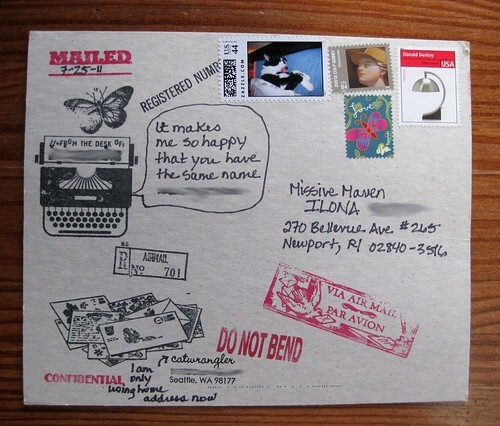 Zura, she used the rubber stamps on the piece of mail pictured with this blog post. If you are using Google reader or a mobile phone, you may not see the photos.